I can’t complain about inspiration, waking up to that view (actually that’s one small part of the 180 degree views from ocean front and right, across bay, to mountains not seen here on left). Working on colour matching, drawing on my android tablet. Looking across the bay towards the mountains at dusk. No detail, just light airbrushing, but I was pretty happy with the colours, especially the transition from mountain to sky. Wax crayons on A3 cartridge paper. Not too bad, focusing on colour mixing, texture, two particular trees against the background of smaller, barer trees just to the left of the photo above. There’s some movement in the main trees, and the rhythm of the other tree trunks. My idea was to apply a wash for background glimpses of sea, sky and land. Applying a wash was not the right choice of technique over water soluble crayon. Or rather, I should have used different crayons for the original drawing. Some mildly interesting water marks, but basically a blurry mess. Trying to get some value out of the previous disaster, I put on lots of colour that may or may not have been in the ocean, and tried moving the colour around and creating texture. Looking for a positive, maybe this could be used as a background sometime. Perhaps I could collage some tissue over first. The markings of the fish on the dinner menu reminded me of that rhythm of tree trunks, so I tried using that as my base. The idea of the fish (at a different scale!) swimming in the ocean behind seemed a nice touch. Realising the strong original design would want to take over I used oil pastels, hoping for decent coverage. I think it nearly, nearly works – but doesn’t work. I felt my observational skills were improving, it was an absorbing problem, I’m really liking working with the oil pastels – so if I focus on the process and not the outcome, OK.
An unfinished sketch of a banksia pod, this time in the water resistant wax pastels. Obviously I was just mucking around with colour. I was planning to do more and finish with another attempt at a wash, but ran out of time. Just as well, while there was still some life and movement and lightness to it. The lower right area where I worked more has gone very dull and bland. Naturally I was also thinking about the next round of casting samples, making quick notes and sketches as ideas came. I’ve been home a couple of days and have attempted a few of them. More on that in another post. Attempts continue to expand my range of mediums when sketching. Inspired by fellow OCA student Sally Harrison (link to just one of her exciting posts) I’ve acquired a range of oil pastels, water-resistant wax pastels, and water-soluble wax pastels, all from Caran D’Ache. Together with my existing Conté crayons that should give me lots of drawing options. Above are first baby steps with all four mediums, on pastel paper. I started with the nice line from the 3D pen on sample p3-26. The oil pastel is particularly luscious, so I continued with that looking at the bubble-wrap based sample p2-23 (on the left in blues). Liking very much the quality of lines I was getting, I tried a more blended approach still with oil, looking at sample p3-25. All samples are from 6-September-2015. The second sketch continues with the oil pastels, my new tool of choice. Wanting to extend my repertoire of drawing base this is A3 kraft paper, an old favourite but varied given previous use as a drop cloth in other sketching, followed by a rough coat of gesso. The sketch itself was thinking about future molding options – this is a computer motherboard, and I’m wondering about its use to create surface design on a molding sample. Doing the sketch I became more aware of all the colours used on the board – on first glance it looks drab, but there is a lot going on! Going a step further, and still within my recurring computer component theme, the base here is cut from the box of a graphics board. Glossy and dark, I wondered if any of the new mediums could handle it. The wax pastels gave a lively line and clung to the difficult surface well, but didn’t have enough coverage to cope with the busy printed design. Back to the oil pastels. The subject above was a piece of bubble wrap draped on my worktable. It’s on the “definite” list for future molding sampling. Back with wax pastels, this is looking at sample p3-33. I thought the finer, still lively lines would suit the delicate energy of the sample. The base is a toned gray sketching paper and my focus was reflected light. The paper was a poor choice, looking dull and drab rather than the bright sparkle of the sample. I’m also not taking advantage of the properties of my new mediums, so will need to start experimenting with layering washes. 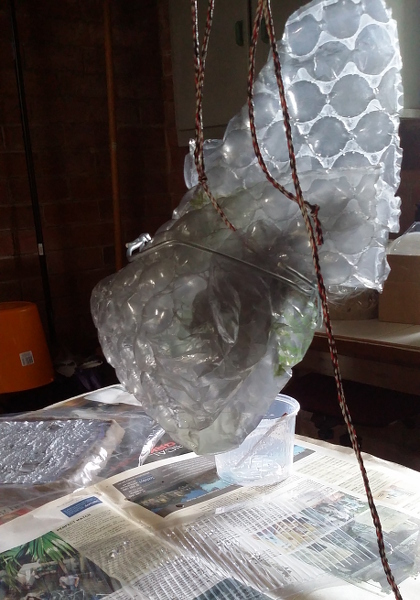 Project 2 involves casting the internal space of a vessel. 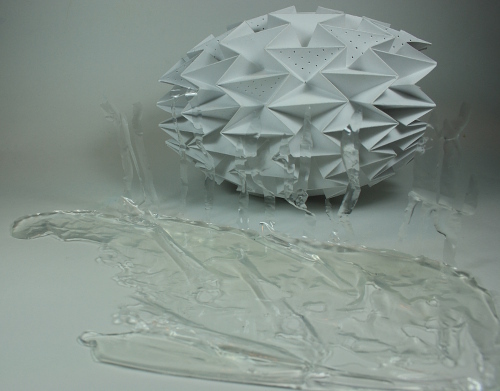 I wanted to try casting with both clear and opaque materials. 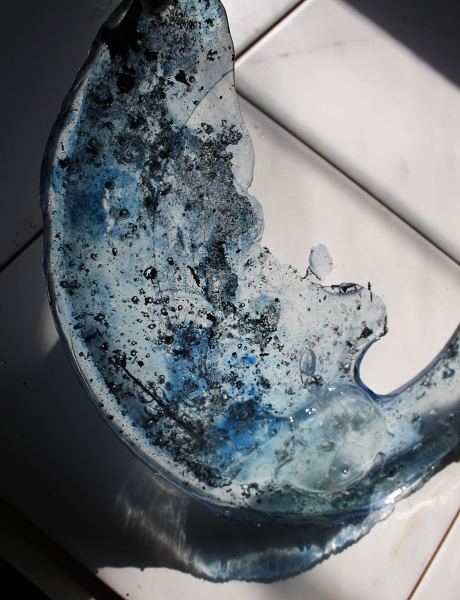 I heard about a great clear bio resin from eggpicnic (9-August-2015). 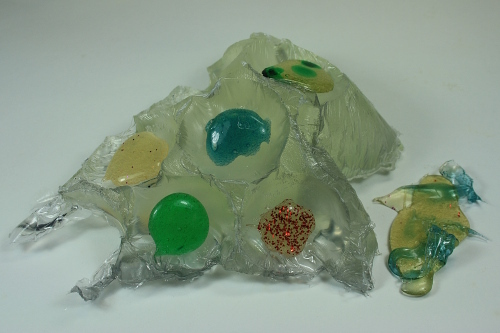 Entropy Resins (entropyresins.com/) make a number of epoxy resins that have green credentials based on production techniques (less energy and produce less harmful byproducts) and content (waste products from other industry, a percentage of renewable plant-based carbon rather than petroleum based carbon). Plus the word was that bio resins have much reduced odor. In Australia the best sources seem to be surfboard shops. 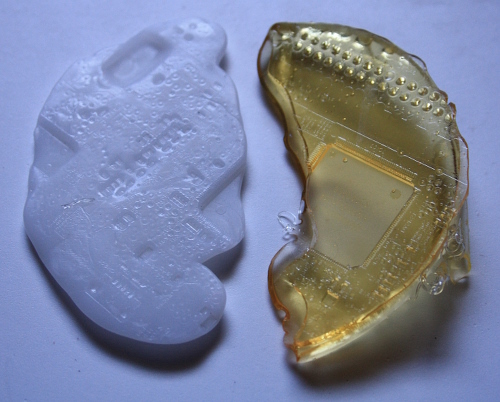 A mix of errors made by me and the supplier left me with Super Sap BRT (specially formulated for white surfboard lamination) instead of the intended Super Sap CCR (designed for casting and embedding). Never mind, I’m not generally using any materials as the manufacturer expected. 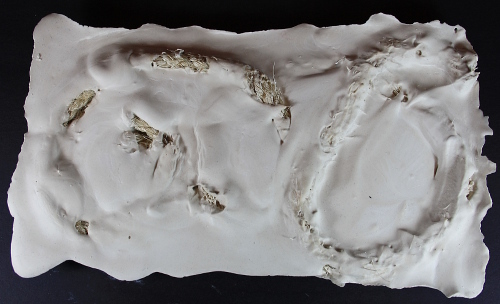 Following my research of artists for this assignment concrete looked a very attractive choice, but given this is short term, small scale, home based use I chose to go for plaster instead – moulding (casting) plaster from Aldax. 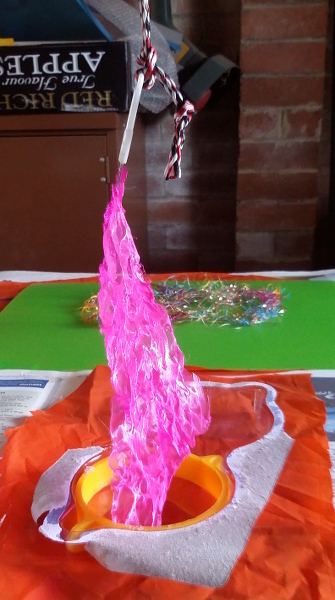 The plan for initial samples was focused on learning basic mixing and handling of the materials. 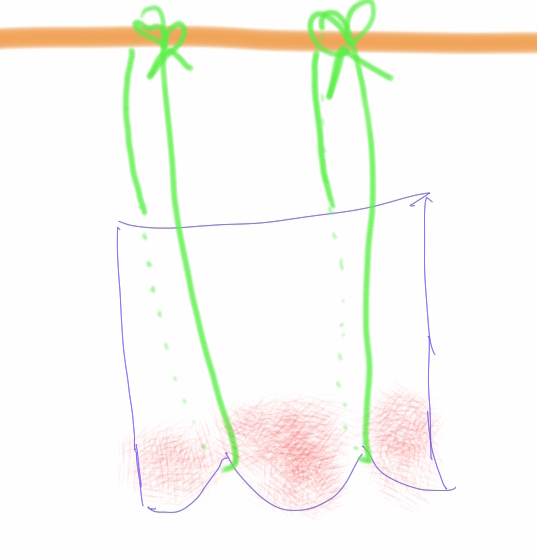 They would be placed in a ziplock sandwich bag and suspended with two ties. 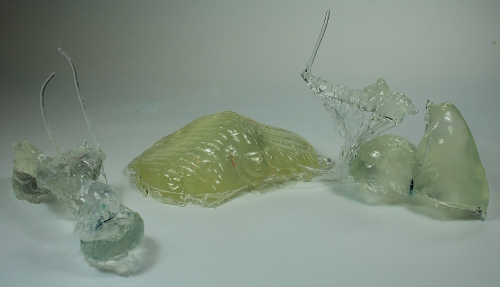 Unsure about releasing the resin and plaster from their molds, I wanted to trial a simple release agent – vaseline. 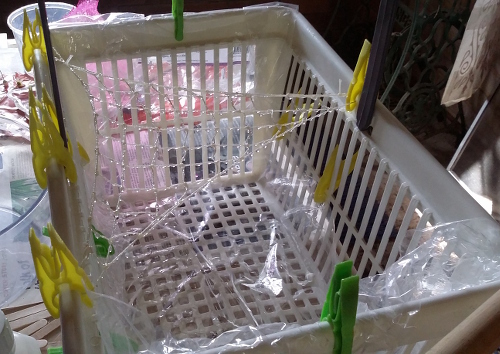 So I started with resin and two plastic bags, one with interior smeared with vaseline, the other plain plastic. Mixing, placing in the bags and hanging to set went smoothly. Within five minutes both bags had failed. One bag was suspended over a bucket, which caught the escaping material. 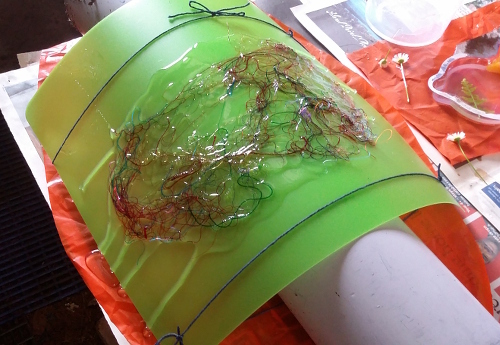 The second was over the worktable, with just two layers of newsprint for protection. 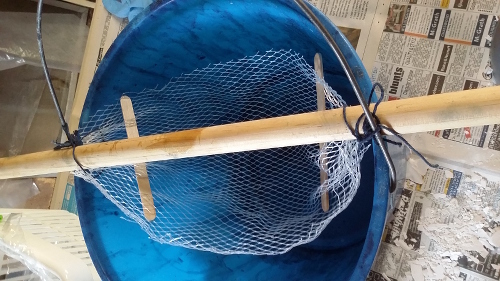 Was it weight, perhaps heat from the exothermic setting (the product I initially wanted had slow cure speeds and low exothermic temperatures more suitable for casting), stresses caused by the ties, something else??? Mixing up the plaster I chose a less ambitious manipulation, simply laying the bags of material across a raised level on the table. Then I pretended to be patient for a couple of hours while resin and plaster hardened. 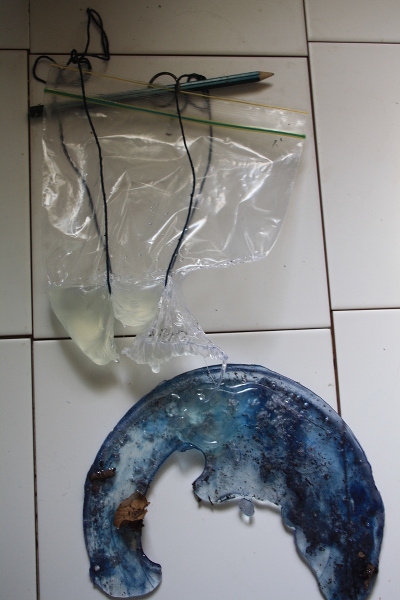 On the right the resin bag with no added release agent, complete with bulk of the resin from the bucket (last used when indigo dyeing and not rinsed since). The indigo-contaminated pool of resin had separated easily from the bucket and at the detail level is really rather lovely. There are bubbles and bits of dried leaves as well as the indigo blue. 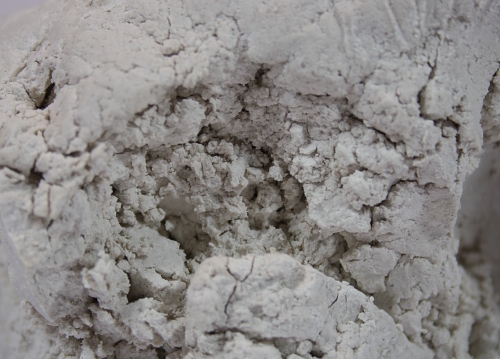 The top surface is glossy, the bottom a soft sheen from the bucket (and perhaps dirt!). 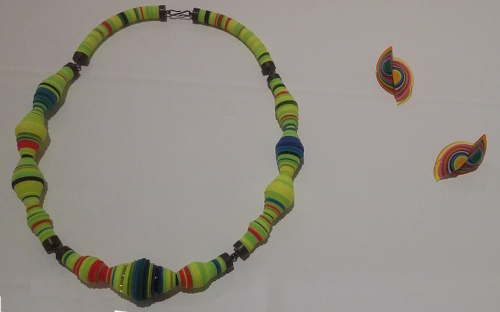 This suggests all sorts of potential for colouring, texturing and patterning – perhaps in a more controlled manner. The plastic bag separated quite easily on the more exposed areas, but was sometimes caught in the creases of the highly molded areas. I was able to remove all the obvious plastic (this is the sample with no release agent). A small piece of the suspending string also remains caught. 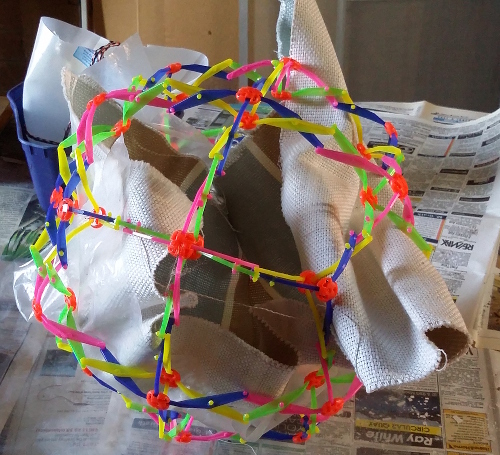 The final shape is complex and engaging. Is it an elephant, a yawning camel? The photographs were taken soon after demolding. Later in the day the cloudiness of the thicker areas has reduced. It will be interesting to do another comparison in a week, when the resin should be fully cured. 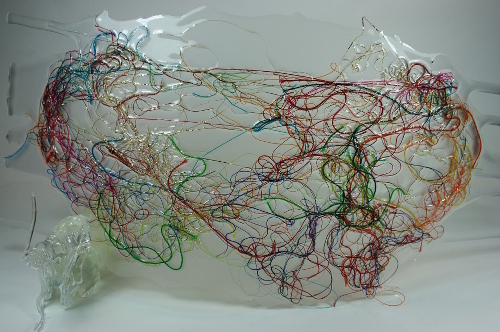 Although not intended the resin has captured the moments just after failure of the plastic, and the combination of mass and delicacy with just a little dynamic movement is effective. 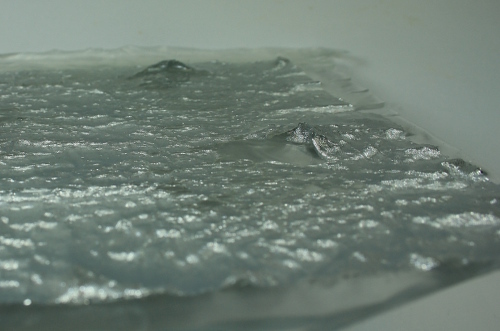 The second resin sample is more reminiscent of a scuttling insect. Possibly more material was lost, or there was less in the bag, as there is definitely less material included. 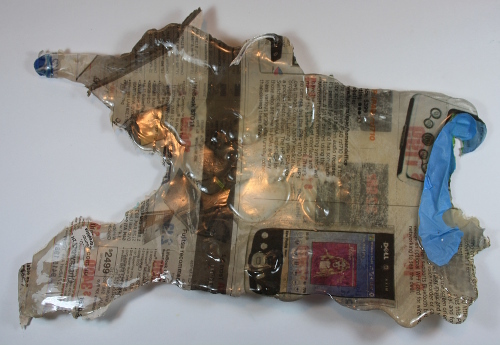 The spilt material is thoroughly bonded to the newspaper that covered the worktable. Soaking in water and rubbing have had little effect. 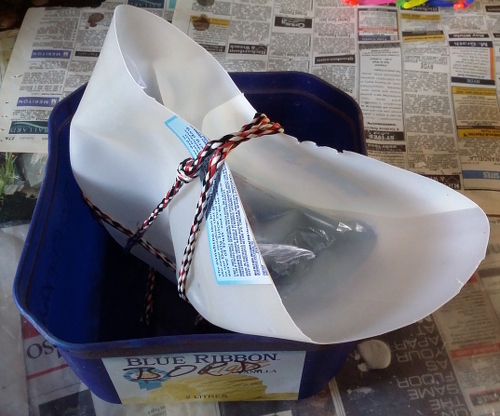 I wonder what effect the resin would have on crumpled paper. At some stage I should try drilling into this material. It could be useful to be able to stitch or tie to create a join. Perhaps this is a way of manipulating / preparing text or imagery for incorporation in a larger work. Although this sampling entirely failed in terms of the original intention, it has resulted in some very interesting and unusual shapes. They are much more delicate and detailed than I had imagined in researching and preparing for this project. The amended manipulation of the plaster samples was more as I anticipated. 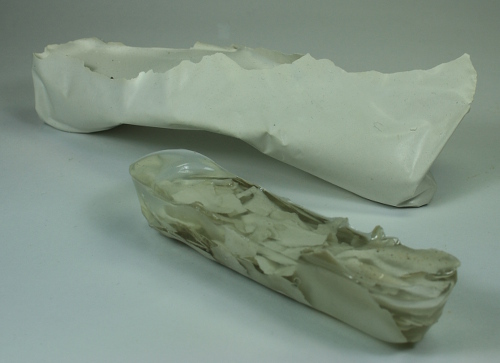 No release agent was used with this sample, but the plastic separated from the set plaster with no difficulty. Shaping and interest was created by lifting the central area of the plaster with a support during the setting time. 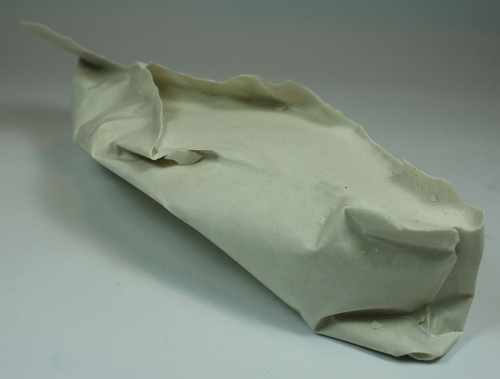 Very thin sheets of plaster stretched up the sides of the plastic bag. Much of this has broken off, but a delicate edge remains. This contrasts with the heavier bulk at each side, the sense of weight increased by the folding around the corners of the original bag. The surface of the plaster is smooth and shines where it touched the plastic, also adding to the gravity and a certain formality in the cast. There are slight differences in the second plaster sample. 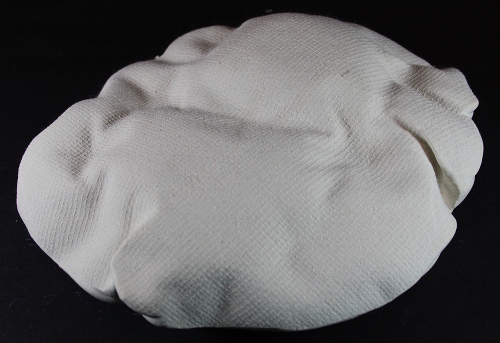 The sandwich bag mold had been smeared with vaseline before casting – a release agent that wasn’t needed. It impacted the surface finish of the plaster, which is textured and rough rather than smooth and polished in appearance. 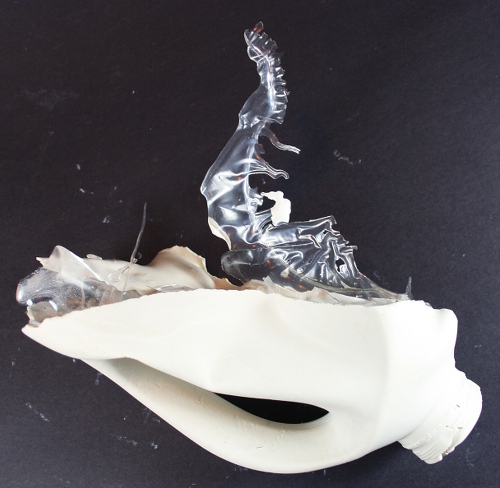 There were lots of small, irregular pieces of plaster caught on the sides of the plastic rather large flat thin sheets. With both samples the nature of the original container is apparent. The bottom fold of the plastic bag has left a clear line. The corners have left easily understood folds. That’s not necessarily a bad (or good) thing, but I would like to develop some alternatives. 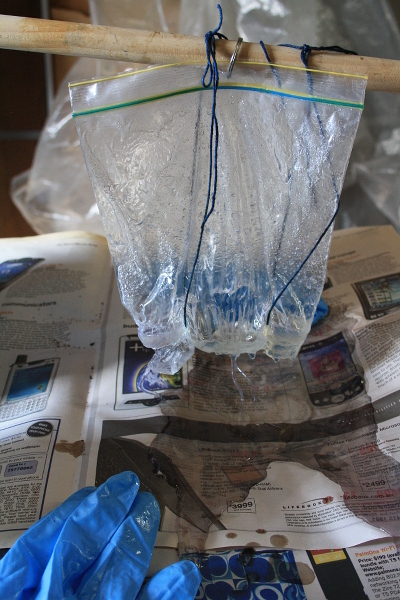 There were a few dregs of resin left in the mixing container, so some quick experiments were added to the plan. 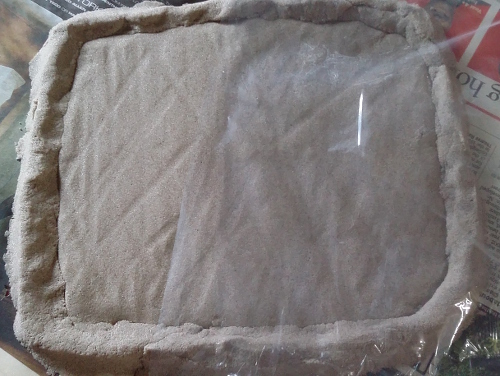 Could kinetic sand (16-April-2015) be used as a mold for resin? 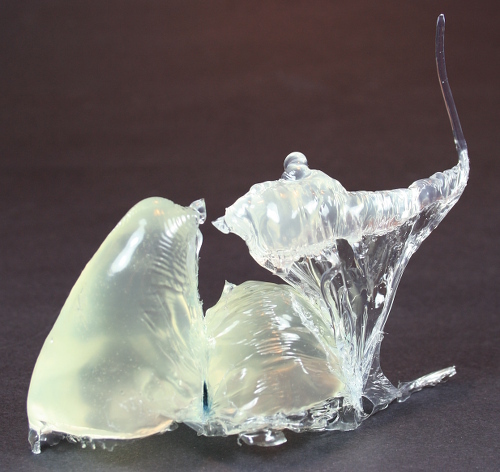 This could give a lot of flexibility and avoid constraints of fixed molds. Answer: no, at least not when used as I did with no lining. The resin seeped into the sand. It didn’t harden it, but substantially reduced its flow characteristics. 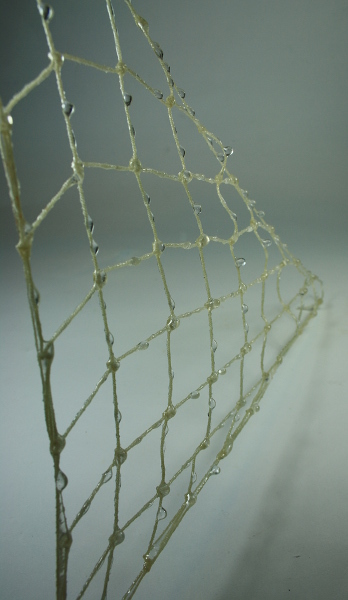 Could resin be used as a coating on an object, like a stiff varnish, without fully embedding the object? Answer: inconclusive. I dribbled on the last of the resin and spread it across the surface of the leaf with my mixing stick. 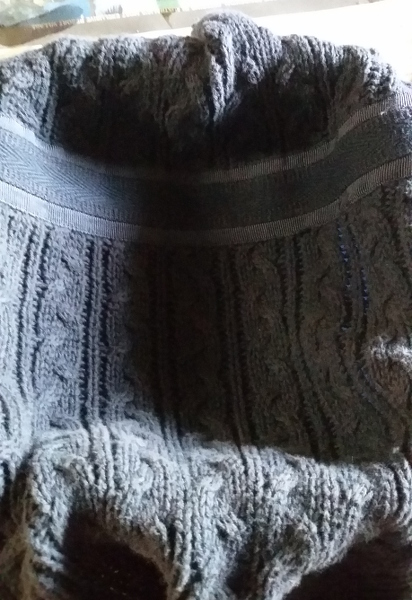 More seeped underneath than I realised, so there is more embedding than intended. 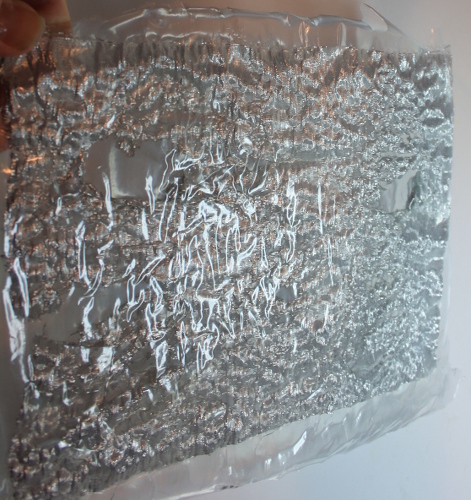 Some embossed markings from the container – recycling and manufacturer information – were captured in the resin. That’s a good reminder to be very conscious of all elements of a make-shift mold. 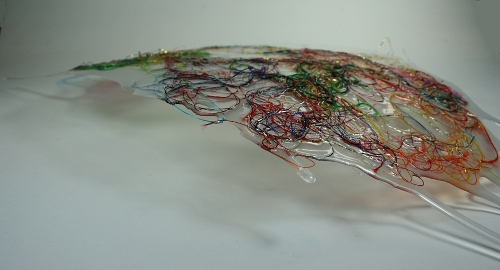 A different technique might give the effect I was looking for – suspend the object and apply resin on all sides. A dribble might form, but that could probably be removed discretely. 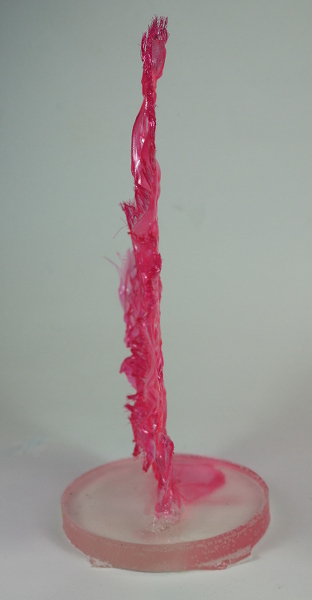 What would my wooden mixing stick look like if entirely covered in resin? Answer: a varnished wooden mixing stick. Within minutes of setting them up my resin samples looked like a messy failure. When those complex shapes appeared from the ruins they seemed glorious, triumphant or even phoenix-like. I’ve been working on this post a couple of days, and in my mind a question mark has appeared. Glorious? Complex, yes. They grab my eye and I pause to try to make sense of them, as if I should recognise them somehow. Interesting, but I’m not convinced they have potential – or not direct potential. They are so fussy and intricate. I don’t think the shapes would work scaled up. They would have to be simplified and that free, chaotic, dynamic look would be hard to retain. They are frivolous, showy. They defy gravity, even while gravity had such a direct impact on their shaping. I couldn’t see them building into something real, something beyond a sample. I had reached that conclusion, then turned around to look once more at the offending samples… and saw something else. The overall shape of these two samples is similar – long, low, with a lifted bridge-like section in the middle. As the maker I know that gravity was involved in both in quite different ways. 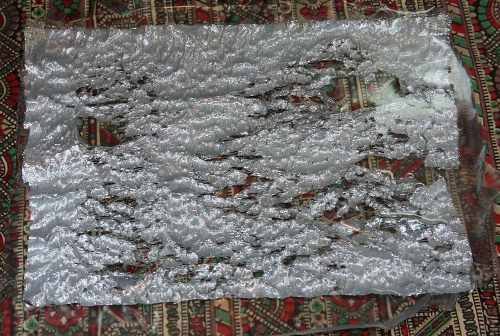 Sample p3-34 was made the other way up, and the “bridge” formed because resin flowed out and the level of material was lower. Sample p3-36 “defied” gravity, with extra support placed under the middle. Still, there is a visual link and I think they look good together. Light is reflected, light is absorbed. There are sharp lines and smooth curves. 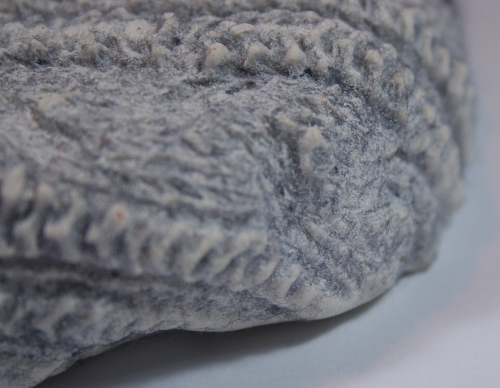 There is softness and hardness and variation in texture.